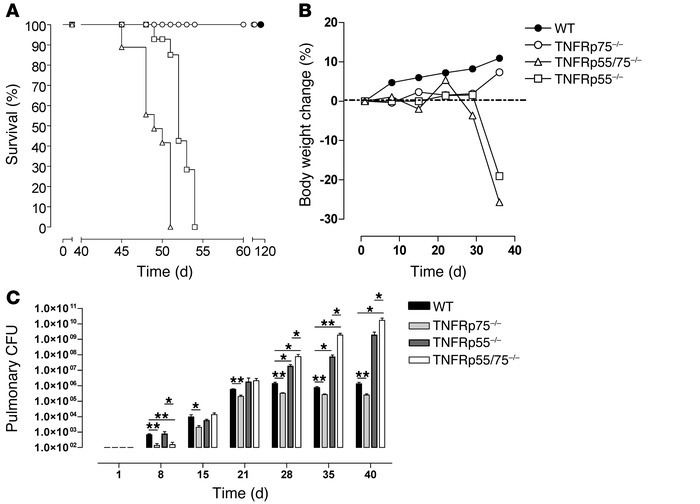 Enhanced acute control of M. tuberculosis replication in TNFRp75–/– mice. WT, TNFRp75–/–, TNFRp55–/–, and TNFRp55/75–/– mice were infected with 50–100 CFU M. tuberculosis. Mice were monitored for survival (A), and body weight changes were measured (B) (n = 10 per group). Pulmonary bacilli burden (C) was determined at the indicated time points by colony enumeration assay. Data (mean ± SEM of the CFU of 4 mice per time point) are representative of 3 similar experiments. *P < 0.05, **P < 0.01, ANOVA.